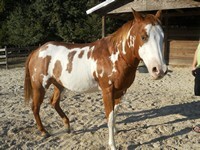 Elmo is a 5 year old overo paint gelding. Elmo came to Dog4u,Inc. as an underfed two year old. 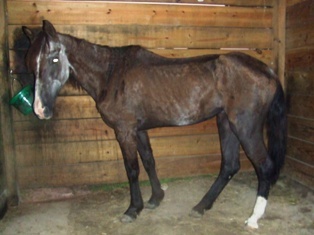 The veterinarian diagnosed him with joint problems that would resolve themselves with a proper feed regimen and over a year of down time. Elmo’s growth has been stunted due to lack of proper nutrition early on, but he now stands 14.3 hands and has filled out nicely. 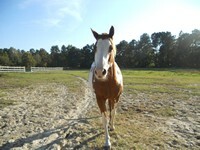 He is “green broke” and has been on several trail rides. He has excellent ground manners and is very people oriented. 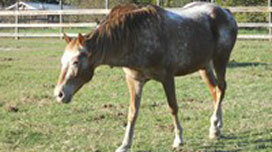 He has shown aggression towards other geldings in the paddock and on the trail. He will need an experienced rider to help him reach his full potential. 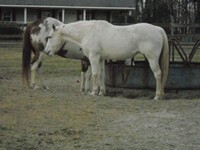 He would do best in a home without other geldings.